Andy’s involvement with comedy or more specifically stand-up comedy, came about after a consistent knack of introducing some light hearted elements into training particularly delivered within the NHS. Someone suggested to Andy that he should take all the funny bits from his training courses and perform them as a show. Without any previous experience of performing stand-up the only place he was aware of that had comedy as an integral part of the set up was the Fringe Festival in Edinburgh. So after attending a workshop in Leicester, on how to put a show on at the Fringe, his relationship with the Edinburgh Festival began with a debut show for a month (taking his annual leave all in one go) in 2004. Venue: The Oxygen Bar on Infirmary Street, you really couldn’t make it up! 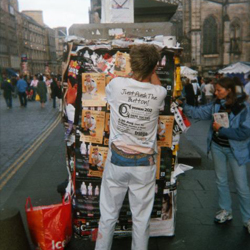 As part of C Venues performing daily in the downstairs theatre space after spending the morning marketing on The Royal Mile as either himself or Bertie Flatulence (The Drunk Waiter). An almost vertical learning curve which at times left him wondering what he was doing putting himself through such torment that brought both highs and lows. Reviewed by the one and only Kate Copstick (reviewer for The Scotsman) whose reputation to condemn the worst of the Festival and applaud the best was probably the most nerve racking show he had ever performed. Just before he went on being told that Kate was in didn’t help his butterflies. “if she hates you, you’ll never work again!”. She gave Andy three stars in The Scotsman and called him “a warm, funny, camp entertaining bloke”. In his eyes a success for a novice whose comedy cherry had been taken by a very welcoming Edinburgh. In 2005 the first Hull Comedy Festival beckoned back then an event that supported and involved more local talent. Andy sold out for four nights. In fact he was the first sell out show of the festival. 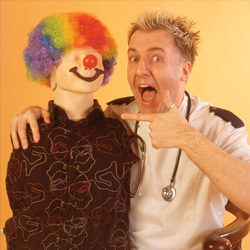 Since then he has performed from time to time with additional material but always having an affinity to his NHS experiences and light hearted look at first aid and resuscitation. 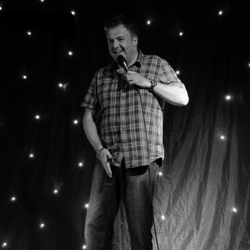 Andy has compered and facilitates comedy workshops for other local hopefuls. Charity nights have been a main stay although he has taken to other stages in Hull, Leeds, Manchester and Sheffield in various comedy clubs. Venues where most comedians cut their teeth, many whom never get a chance or are inclined to perform in Edinburgh, ever.